ORLANDO | As the faithful prepare to celebrate the birth of our Lord, Jesus Christ, it is a good time to pause and reflect upon the gifts He has given us and what we are prepared to offer Him this Christmas. Advent is a time of waiting—a good time to shift our focus from the busyness propelled by secular messages of Christmas, to contemplative prayer, allowing the Nativity to continue its centuries’ old transformation of the human heart, as we sit in silence with our Creator. “Contemplation is a gift from God. It’s not something I do. It’s something that God does in me,” acknowledges Basha Perez, a longtime professed contemplative from Annunciation Parish in Altamonte Springs. Her 30-year practice of sitting in silence has born loving fruit in her spiritual life and outward behavior that she can only explain as the work of the Holy Spirit. The Catechism of the Catholic Church says it is because this regular practice of sitting in silence allows God to speak to the soul and gradually “conforms man, the image of God, to his likeness” (CCC, 2713). The Catechism says, “Contemplation is a gaze of faith, fixed on Jesus. This focus on Jesus is a renunciation of self. His gaze purifies our heart; the light of the countenance of Jesus illumines the eyes of our heart and teaches us to see everything in the light of His truth and His compassion for all men,” (CCC, 2715). The effect is a transformation in the way in which we see the world, its events, and how life is lived each moment—even within the hectic pace of this joyous season. Father Leo Hodges, pastor of St. Andrew Parish in Orlando, first learned of contemplative prayer while at St. Meinrad Seminary and School of Theology, Indiana. He practices a form of contemplation called centering prayer. “Contemplation has a way of rewiring the brain. It helps me have clarity. It keeps me grounded,” he explained. “It helps me be more present to myself, to the people I have contact with and to the world that I live in.” He added, “It helps me be more stable as far as my emotional life and it provides a simple connectedness and deep abiding presence with God, which for me, provides a sense that everything’s going to be alright. I am more patient. I am certainly more open… I trust the process and unfolding of my life better than I used to.” Much of that is due to contemplation’s most gracious gift, the development of an intrinsic trust in God’s providence and an awareness that God is never further than oneself. The practice is founded in the Scripture from Matthew 6:6, “But you, when you pray, go into your inner room, close your door and pray to your Father who is in secret, and your Father who sees what is done in secret will reward you.” Perez attests to these rewards. A trained facilitator of the practice, Perez says sitting for 20 minutes each day in silent prayer has made a difference. “I took inventory of myself and my life,” she said. “I was honest and admitted that I was an unhappy, miserable person and I made everyone around me that way. It didn’t matter what I did, nothing changed.” Contemplation brought her self-awareness and peace. “I was a great one for reacting out of anger and judging people,” she said. “Through the practice of the prayer and a lot of spiritual formation, I recognized my own behaviors. I bring that honesty to the prayer and allow the Holy Spirit to transform me.” This is food for thought as we approach a new year and think about resolutions. The late Trappist, Father Thomas Keating, developed the centering prayer practice, which is rooted in the 14th century book The Cloud of Unknowing. Although Father Keating died this past October, his 30 years of work in contemplative prayer are renowned. Motivated by Pope St. John XXIII’s request, at the inception of the Second Vatican Council, Keating was asked to begin dialogue with Christian and non-Christian religions in a desire to restore the Church’s meditative practices. The goal: deepening man’s relationship with God. What Father Keating discovered was that the Desert Fathers and Mothers had been practicing contemplation all along. The great mystics like St. John of the Cross, St. Teresa of Avila and St. Julian of Norwich were also contemplatives who offered much in the way of guidance. For Father Hodges, Perez and Gallagher, contemplation is a way of life and a call to meet God in the silence. 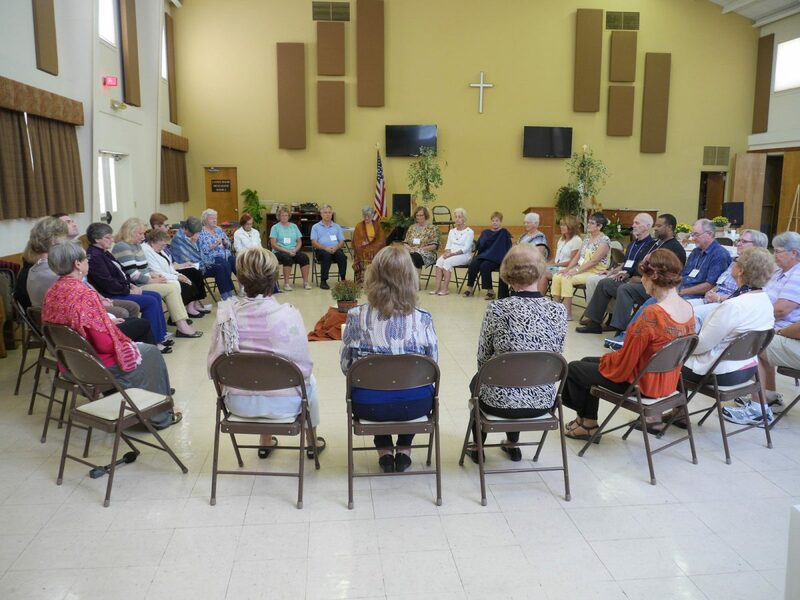 Gallagher noted that not having to “create any words or thoughts or feelings” enables her to “just sit in God’s presence and… love one another just resting with each other. I think that pleases God – that I just want to spend time with Him in this quiet attitude. We kind of just bask in each other’s presence.” What a beautiful gift for Jesus. Perhaps Advent is the perfect time to respond to that beckoning that is in each of us.